In the coming decades, the United States is projected to have a rapidly aging population. Moreover, it is important to note that this aging is spread across both native born and foreign born people. As immigration continues to be a fundamental part of the nation’s growth, the foreign born population as a whole will increase, too. Notice how the age pyramid starts with the bulk of the population on the bottom (Baby Boomers) and how the bulge gradually moves up the pyramid. By 2060, the United States is projected to have a far higher percentage of elderly residents and a lower percentage of youth. In fact, the average age in the U.S. is currently about 37 years old, but is projected to be about 41 years old by 2060. Along with the median age of the population as a whole, the number of foreign born people is also projected to increase. 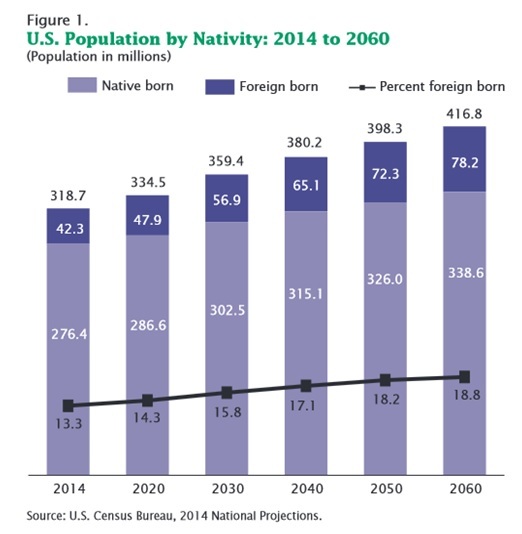 Overall, 18.8% of the United States population projected to be foreign born in 2060, up from 13.3% in 2014. Since many immigrants do not initially speak English when they settle in the U.S., providing voting materials and ballots in more languages will be a crucial development in the coming decades. Minnesota currently offers election materials in Hmong, Somali, Spanish, Russian and Vietnamese and plans to offer Mandarin, Oromo, Amharic, Laotian and Cambodian by the 2016 election. As we have seen throughout history, continuing immigration patterns will require continued efforts to promote civic engagement throughout the foreign born population. Recognizing these demographic trends now will help incorporate immigrant communities into the electoral process in the future.